Synchronicity struck a couple of weeks ago at Russell Museum. Quite by chance two sailors arrived, within minutes of each other, with one aim in mind – to check out our Endeavour model for seaworthiness. The verdict was unanimous. Yes, it can be done. Our biggest obstacle is likely to be finding 6 tons of lead to use as ballast. The rest is easy, they assured me. So we have every chance of getting her sailing again, perhaps for a January Tall Ships Race, but definitely for the 250 year anniversary of Cook’s arrival in the Bay in 2019. 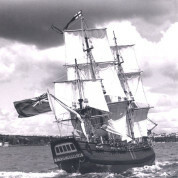 The ship’s original owner, Ralph Sewell, built the one fifth scale model from a photocopy of the original deck plan and details of the Admiralty’s instructions to alter the former Whitby collier, found in J. Beaglehole’s “The Journals of Captain James Cook”. Sewell didn’t have a sail plan-just a spar list. This was no obstacle. Where there are spars there must be sails, he figured. Together with an enthusiastic crew of helpers, Sewell built the model in twelve weeks. He was reportedly “amazed to discover how easily the little model could be handled, how sweetly she could change tacks, how speedy and seaworthy she appeared for a square rigger of only 22 feet “(6.7 metres). The photo shows the model sailing in the Hauraki Gulf.